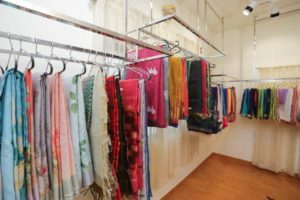 Varnaha Designer Boutique is the latest addition to the San Thome fashion scene. Opened recently by two childhood friends- Asha Marina and Mary Jacqueline, the boutique spread over 1000 sq. feet offers sarees, blouse materials, plazzos and salwar materials. Jacqueline is not new to the fashion field. She was initially in the flower business and moved to designing and customizing jewellery. Asha a computer engineer professional is into this purely out of her passion. Since the both knew each other, they decided to bring their common passion together and start this venture. “Another main reason was to help the weavers and make the sarees available to the buyers directly”, said Asha. The sarees are sourced from both south and north of India and range from cotton, silk, linen, silk cottons with a starting price range of Rs. 700. The readymade salwar sets are available in free size and the materials start from Rs. 900 onwards. The duo plans to slowly expand their unit and add services like online sales, tailoring etc. “We are in the process of going digital and starting a website to make our products available worldwide to the buyers”, they added. “Gradually we may even open more branches. Right now we chose San Thome as it’s a prime area”. The boutique is located at 7, 1s Floor, Papanasam Sivan Salai, San Thome. Ph: 9840909945 / 9940498039. This entry was posted on Friday, February 8th, 2019 and is filed under Sales, Shopping. You can follow any responses to this entry through the RSS 2.0 feed. You can skip to the end and leave a response. Pinging is currently not allowed.